WATERLOO – A team of MBA students from Wilfrid Laurier University’s Lazaridis School of Business & Economics once again claimed first place at the Aspen Institute’s 2016 Business and Society International MBA Case Competition April 29. This is the third win in a row for the Lazaridis School and the fourth in the competition’s seven-year history, with previous wins in 2011, 2014 and 2015, and top 10 honorable mentions in 2012 and 2013. Team members Doryan Bondor, Gautam Khanna, Marshall Peters and Amanda Tong travelled to New York City as one of two Canadian teams competing among five finalist schools. Each team presented their first-round submissions and a new set of slides to a panel of judges and executives from the case company illycafe, a high-end Italian coffee retailer. Teams were tasked with finding ways to advance the overall quality and traceability of coffee in the global value chain while simultaneously improving the livelihoods of smallholder farmers. Founded in 2009, the Aspen Institute’s Business and Society International MBA Case Competition provides an opportunity for over 1,000 MBA students from 25 leading business schools over three rounds to reflect on the significant influence and positive impact a well-managed business can have on society. The first round had teams of three or four compete against their peers in a 72-hour on-campus case competition authored by the Yale School of Management. Six teams competed in the Lazaridis School’s initial round from April 8-11. A panel of academic advisors at the Aspen Institute blind-reviewed the case submissions of the winning teams selected by each of the 25 participating schools for clarity, creativity and thoroughness. 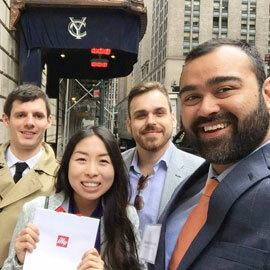 The top five point-earners – which in addition to the Lazaridis School included the University of Denver’s Daniels College of Business, University of Oxford’s Saïd Business School, Concordia University’s John Molson Business School and Villanova School of Business – were invited to the final round on April 28-29 at the Yale Club in New York City. Barry Colbert, associate professor, Lazaridis School and director, P&G Centre for Business and Sustainability, was the team’s faculty advisor and coach. Three past Lazaridis School champions, Priyanka Lloyd (2011), Kate Applin (2015) and Albert Tam (2015), helped to prepare the students for the presentation portion. The Lazaridis School’s participation in the competition was made possible by the P&G Centre for Business and Sustainability, which sponsors the team each year. The Lazaridis School MBA team won a grand prize of $15,000. Find out more information about the Lazaridis MBA program.